Media captionPrime Minister Theresa May said she wanted to "build a better Britain"
The UK's new prime minister Theresa May has vowed to lead a "one nation" government that works for all not just the "privileged few". Speaking outside 10 Downing Street after being appointed by the Queen, she said it would be her mission to "build a better Britain". She promised to give people who were "just managing" and "working around the clock" more control over their lives. Mrs May is the UK's second female prime minister, after Margaret Thatcher. Mrs May later began appointing Cabinet members, with Philip Hammond - foreign secretary under Mr Cameron - becoming chancellor and Boris Johnson becoming the new foreign secretary. Mrs May's husband Philip was standing behind her as she made her first public speech in the role, highlighting the "precious bond" between England, Scotland, Wales and Northern Ireland and between "every one of us". What's on Theresa May's to-do list? "That means fighting against the burning injustice that if you're born poor you will die on average nine years earlier than others," she said. For an "ordinary working class family", she added, "life is much harder than many people in Westminster realise". Speaking directly to people who were "just managing", she said: "The government I lead will be driven, not by the interests of the privileged few, but by yours. We will do everything we can to give you more control over your lives. "When we pass new laws, we'll listen not to the mighty, but to you. When it comes to taxes, we'll prioritise not the wealthy, but you. "When it comes to opportunity, we won't entrench the advantages of the fortunate few, we will do everything we can to help anybody, whatever your background, to go as far as your talents will take you." 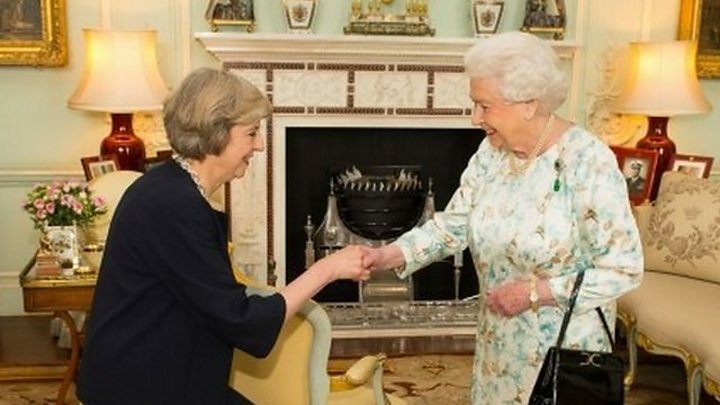 She also paid tribute to her predecessor, David Cameron, saying he had been a "great, modern prime minister". 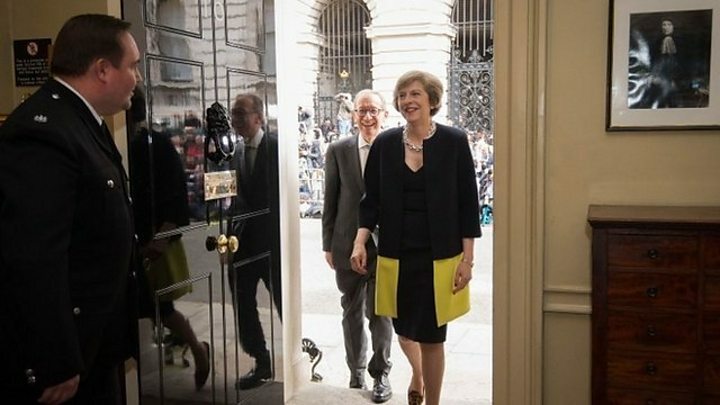 Image caption As his family left Downing Street, Mr Cameron wished the UK "every success"
Earlier the Queen accepted Mr Cameron's resignation as prime minister. In his farewell statement outside Downing Street, Mr Cameron said Mrs May would provide "strong and stable leadership" and wished her well in her negotiations on Britain's exit from the EU. Like Mr Cameron, Mrs May campaigned to remain in the EU but has said she will respect the will of the people, as expressed in 23 June's referendum, saying: "Brexit means Brexit". She has moved quickly to fill key roles in her cabinet. Amber Rudd is the new home secretary, David Davis has been given the new role of Brexit secretary and Liam Fox becomes international trade secretary. Michael Fallon remains in the role of defence secretary. Mr Johnson, Mr Davis and Mr Fox all supported the campaign to leave the EU. Labour's deputy leader, Tom Watson, offered his congratulations to Mrs May but warned she would have to deal with the "enormous economic uncertainty and insecurity" caused by leaving the EU. He said: "We've today had warm words from our new prime minister about the need to stand up for more than a 'privileged few'. "The sentiments are good ones but just like her predecessor the rhetoric is much better than the reality."